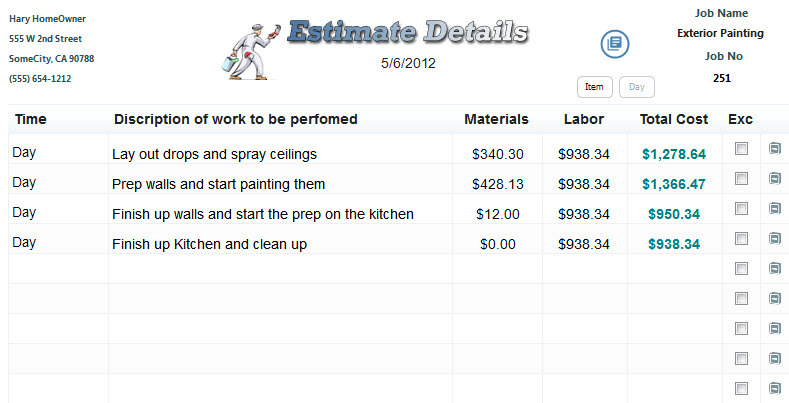 using the Paint Estimator with the day method. Next method is the Day Method. This method is just how it sounds, it's by the day. Let's take a 3 bedroom interior that includes 3 bedrooms, a hallway, living room and a kitchen. In this sample, we are going to lay everything out by what we are going to do each day. So we start with day 1, and try to come up with a plan on what we want to accomplish for that day. In the sample below, we are going to set things up, and spray the ceilings. Try to keep this realistic as to what you really can accomplish to what you would like to accomplish. Again, this to me is not really guessing as I would imagine this is not the first time you have painted an interior before. Then we just keep moving along till we are finished. This job should take us 4 days to complete. Day 1 - Set up, lay drops and cover stuff, spray all ceilings. Day 3 – Should finish up painting walls and starting a little prep on the kitchen. Day 4 – Roll walls and ceilings in kitchen and clean up. Each day is 8 hours and if you selected 3 guys for this job that would be equal to 24 hours in a day (3* 8). This method kind of lets lay out what you want to accomplish each day. Again you are most likely going off prior results or similar jobs you have done in the past. The only difference is you are not measuring the walls and coming up with a price per Sqft. Here is a screen shot of the day method. 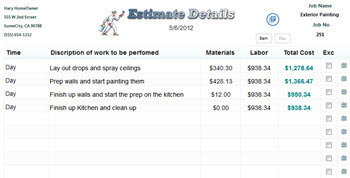 The main difference from the item method is you have a time column where you can select Day, Week or Month. Each day consists of 8 hours and it is based off the number of employees working on the job.